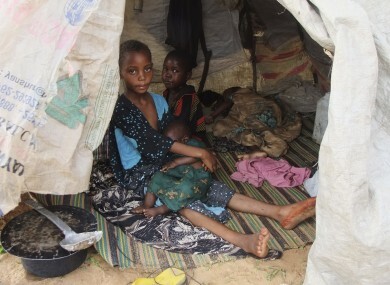 TENS OF THOUSANDS of children have died due to the famine in Somalia. Meanwhile, refugee camps in east Ethopia struggle to cope with the huge numbers of people arriving from its stricken neighbour. The UN Refugee Agency said yesterday that more than 118,000 Somali refugees are living in three camps run by the UNHCR and the government in the Dollo Ado district of eastern Ethiopia. A fourth camp is under construction to provide shelter for an additional 40,000 people. The current camps, Kobe, Malkadida and Bokolmanyo, were designed to accomodate 20,000 people – they each hold more than double that number. The UNHCR said it is also concerned about violence in south and central Somalia between the opposition al-Shabab militia and the government. This fighting is causing more people to flee these areas. The UN food agency says it is not able to reach 2.2 million Somalis who live in areas that are under the control of al-Shabab. More than 12 million people are being affected by droughts in the eastern Horn of Africa, chiefly in Ethiopia, Kenya and Somalia. There are around 2,000 refugees arriving in Ethiopia and Kenya every day from Somalia, the US Senate Foreign Relations Subcommittee on African Affairs heard this week, and this number is expected to increase. Concern Worldwide announced it has raised more than €3 million from the Irish Public for its emergency work in the Horn of Africa, while Trócaire has raised more than €2 million. Paul O’Brien, Overseas Director with Concern, thanked the Irish public and said “these funds have allowed us to reach over half a million people with basic supplies including food, water and cash”. The UN announced yesterday that three new areas in Somalia are facing famine: the Middle Shabelle region, the Afgooye corridor settlements and parts of Mogadishu. The UN’s Food and Agriculture Organisation said that famine is expected to spread across all regions in the south in the coming four to six weeks, and will persist until at least the end of this year. Somalis have been speaking to the Associated Press about their experiences during the crisis. One woman, Kaltum Mohamed, trekked to Somalia’s capital, Mogadishu, in search of aid. She and her husband had five children, but four died before they could make it to their destination. Her family belongs to a tribe of pastoral nomads, but all of their livestock died in the drought. Death is inevitable. But the surprise was how suddenly I lost my four children in less than 24 hours because of famine. Nancy Lindborg, an official with the US government aid arm, told a congressional committee in Washington on Wednesday that the US estimates that more than 29,000 children under the age of 5 have died in the past 90 days. Earlier this week, thousands of Somalis were moved into an extended refugee camp in Kenya to help relieve overcrowding. Email “29,000 children 'killed by Somalia famine'”. Feedback on “29,000 children 'killed by Somalia famine'”.